Over the course of the summer, the JimiLab Crew had finished our first Android mobile app, developed a brand new web app from scratch, immensely improved the playlist algorithm, built a bunch of important backend tools, and added a lot more high quality (local) music tracks. So we were looking for a opportunity to “relaunch” MegsRadio to the Ithaca community. We identified this past weekend (Sept 23-24, 2017) as our best opportunity because two epic music events were colliding in downtown Ithaca: Cayuga Sound & Porchfest. 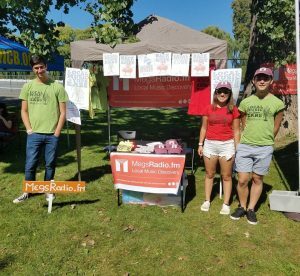 It was time to break out our tent and big banners so that we could engage the local community at these live music events. Internally, we referred this past weekend at MegsLaunch 2017. 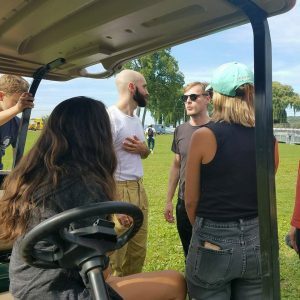 The inaugural Cayuga Sound Festival was a homecoming event organized by the super successful X Ambassadors. They brought with them The Roots, K.Flay, and a bunch of other top nationally touring acts. They also invited a bunch of local artists (Sammus, The Imperials, Stone Cold Miracle) to share the stage. As part of their outreach efforts, Sam Harris (lead singer), Casey Harris (keyboards), Seth Kallen (Manager), and Dan Smalls (Cayuga Sound Organizer) took part of open panel entitled “The X Ambassadors Story“. Sam and Casey talk in depth about growing up in Ithaca. In many ways, their experience closely resembled my own experience growing up as an iTown native playing in a high school rock band: rocking the old Haunt, getting into local music festivals, self-producing our own CD, and thinking about taking the show on the road after graduation. They also talked about their love for our “weird and supportive” community in Ithaca. Anybody who knows me knows that I feel the same way. Elena Piech (MegsRadio Outreach Coordinator and all-around dynamo) organized a volunteer crew from the JimiLab to help out with setup on Thursday and Friday. They got to meet Sam and Casey, and despite being a little star struck, were able to tell them a little bit about our MegsRadio project. We also generated a bunch of interest from folks who stop by our tent during the festival on Saturday. The Star-studded Cayuga Sound festival in Stewart Park on Saturday gave way to a low-key Porchfest on Sunday. Porchfest started in Ithaca back in 2007 with a handful of bands playing free music sets on porches in my Fall Creek neighborhood. These days, over 185 artists sign up and play for ten’s of thousands of fans and fellow musicians. Most folks meander around the residential streets trying to take in as much music as possible during the afternoon. And it has now been replicated in over 100 cites across the US and Canada. 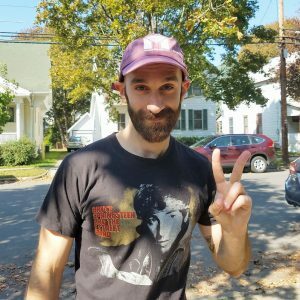 Porchfest is all about serendipity and exploration which is why I often tell people that Porchfest is the physical analog to our digital MegsRadio mission. Sam Harris of the X Ambassadors rockin’ a MegsRadio hat at Porchfest. My students had our official “MegsRadio ReLaunch” party on JimiLab alum Luke Waldner’s porch in the heart of Fall Creek. They hosted a bunch of bands from Ithaca College, handed out stickers, gave aways our new hats, and talked with locals about music in Ithaca. And we caught a picture of Sam Harris rocking his MegsRadio hat as he strolled around Porchfest. Unfortunately, I missed the whole massive weekend since I am on sabbatical in Singapore for the next few month. That said, I could not be more happy to have such a dedicated and talented team of students running the show. The JimiLab Crew is the best!